Flying Colours Corp. reached a significant milestone as its Peterborough facility re-delivered its 100th major retrofit of a Bombardier Challenger model. The Challenger 604, delivered in the first week of October, underwent what the company describes as a major overhaul of the cabin, avionics, connectivity and fuselage. Minor maintenance was conducted as the same aircraft had undergone a 96-month check at Flying Colours’ Canadian headquarters just over a year ago for its previous owner. The Peterborough design team worked with the new owner and current operator, explains Flying Colours, to create a stylish interior featuring a black and gold palette. Based on the client’s request for a contemporary cabin, including seats with improved comfort, Flying Colours’ design team adapted Challenger 650-style seat frames, purchased from Rockwell Collins Interior Systems, to feature molded armrests that arch to fit the curves of the arm. Continuing to describe this milestone retrofit, Flying Colours explains the six reclining individual seats, and complementary three-place divan, were finished using a soft but durable black leather with a perforated insert, medium-beige coloured leather accent panels, and a single contrasting seam stitch trim, to bring a modern and comfortable feel to the cabin. The light trims, buckles and control panels feature a matte gold to contrast with the leather. Customized monuments, including side ledges, panels and doors, are finished with a gloss anigre veneer with each fold-out table incorporating a matte-gold inlay accent. As Gillespie pointed out, the private owner also took the opportunity to update cabin connectivity with the Gogo AVANCE L3 air-to-ground connectivity system to provide WiFi access for voice, email, browsing, moving maps, and a selection of movies and TV programs across the North American region. This Challenger’s inflight entertainment also includes a Rockwell Collins Venue system with new monitors installed at the front and aft of the cabin. Both crew and passengers can control lighting, temperature and entertainment choices, as well as view Airshow moving maps, from their digital devices. Cabin crew also have access to a completely modernized galley featuring a new TIA microwave, customized coffee maker and generous storage. The flight deck was also treated to a major overhaul, explains Flying Colours, with Rockwell Collins’ Future Airspace Navigation System (FANS) 1/A to improve situational and environmental awareness. 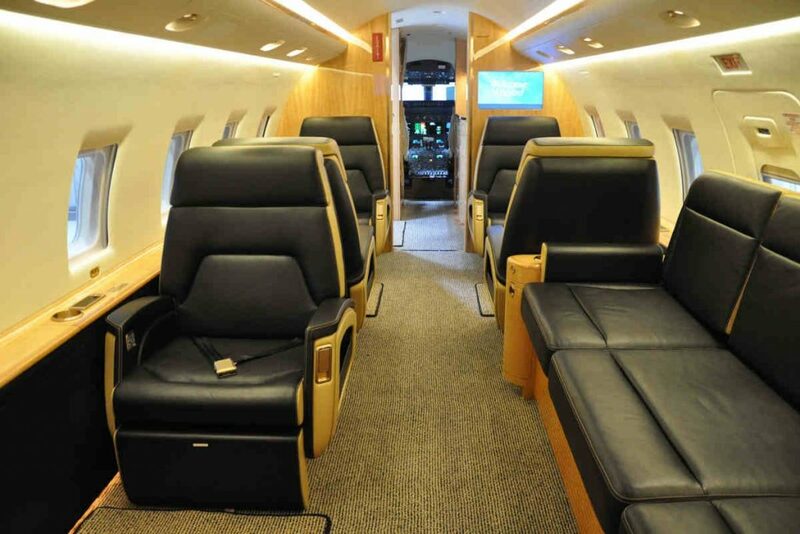 The upgrade was combined with installation of soon-to-be mandatory ADS-B Out tracking equipment, for which Flying Colours holds the STC on Challenger 604 types. The company’s Peterborough paint shop revitalized the fuselage with work reflecting the interior colours. Flying Colours explains a partial gold stripe sweeps from the tail to midway along the fuselage and sits above a full black stripe that sweeps in an arc to the front of the aircraft. Flying Colours delivers Challenger 850 to Lily Jet of China.